The water level of the children's fishing pond has been lowered until further notice. A large tree limb fell on the dam and damaged several stones. Until repairs can be made, the fishing pond will remain drawn down. Trail Advisory: Please proceed with caution when hiking on Tobecco Trail. Be advised the trail is not well established and terrain is rugged. The park is making efforts to improve trail conditions. The 8,500-acre Cook Forest State Park and 3,136-acre Clarion River Lands lie in scenic northwestern Pennsylvania. Known for its stands of old growth forest, the park’s Forest Cathedral of towering white pines and hemlocks is a National Natural Landmark. A scenic 13-mile stretch of the Clarion River flows through Cook Forest State Park and is popular for canoeing, kayaking, and tubing. Clear Creek State Park is only 11 miles away. From the east, take Exit 78 off of I-80, then PA 36 north directly to the park in Cooksburg. From the west, take Exit 60 off of I-80, then take PA 66 north to Leeper. From Leeper, follow PA 36 south, seven miles to the park. Wi-Fi is available inside the park office and within a short distance surrounding the office building. 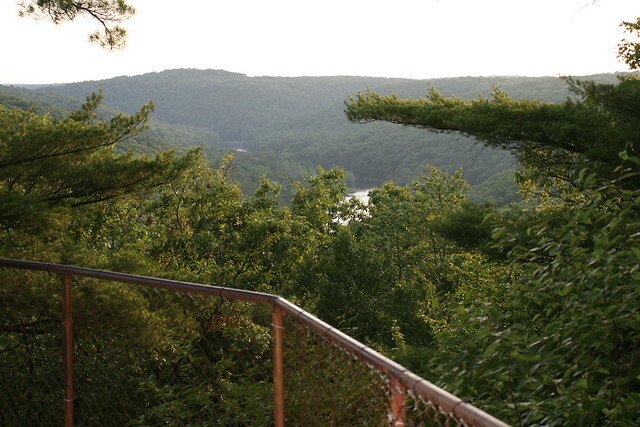 From the rock ledges of Seneca Point Overlook, you can see the Clarion River Valley. Do not walk or climb on the rock outcroppings outside of the fenced area. These rock ledges are hazardous. An 80-foot climb up Historic Fire Tower #9 reveals a breathtaking view of the entire area. On a clear day, you can see points 15 to 20 miles away. A local, non-profit craft organization housed in the historic sawmill offers traditional crafts, a gift shop, and classes. Demonstrations and classes on various crafts are presented throughout the summer and fall. The Verna Leith Sawmill Theater presents plays, musicals, and other entertainment throughout the summer season. Through hands-on activities, guided walks, and evening programs, participants gain appreciation, understanding, and develop a sense of stewardship toward natural and cultural resources. Programs are offered year round. Curriculum-based environmental education programs are available to schools and youth groups. Teacher workshops are available. Group programs must be scheduled in advance by calling the park office. The center offers indoor space for programs and displays historic logging and rafting tools, models, and artifacts. Black bears are native to this area. All food should be put away after use and kept in a tight, secure container in the trunk of a car or in a camper. Feeding wildlife is prohibited. When wildlife loses its fear of people, these animals can become pests, and dangerous situations can result.